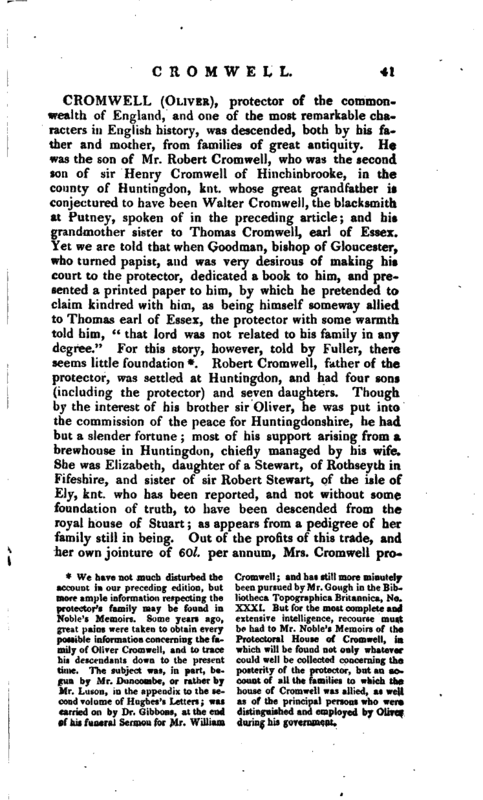 We have not much disturbed the account in our preceding edition, but more ample information respecting the protector’s family may be found in Noble’s Memoirs. 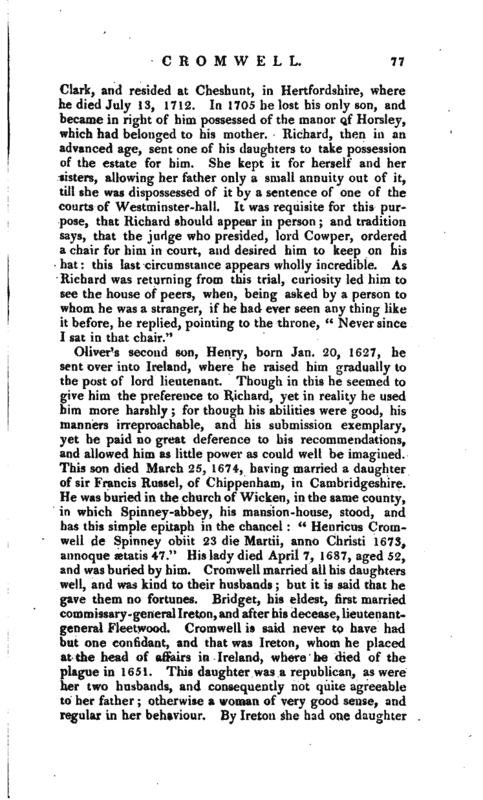 Some years ago, great pains were taken to obtain every possible information concerning the family of Oliver Cromwell, and to trace his descendants down to the present time. 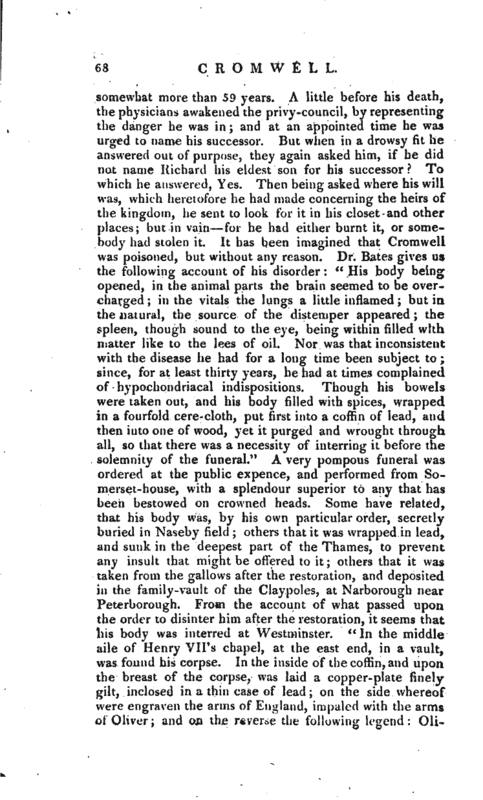 The subject was, in part, begun by Mr. Duncombe, or rather by Mr. Luson, in the appendix to the second volume of Hnghes’s Letters; was carried on by Dr. Gibbons, at the end of his funeral Sermon for Mr. William Cromwell; and has still more minutely been pursued by Mr. Gough in the Bibliotheca Topographica Bniannica, No. XXXI. 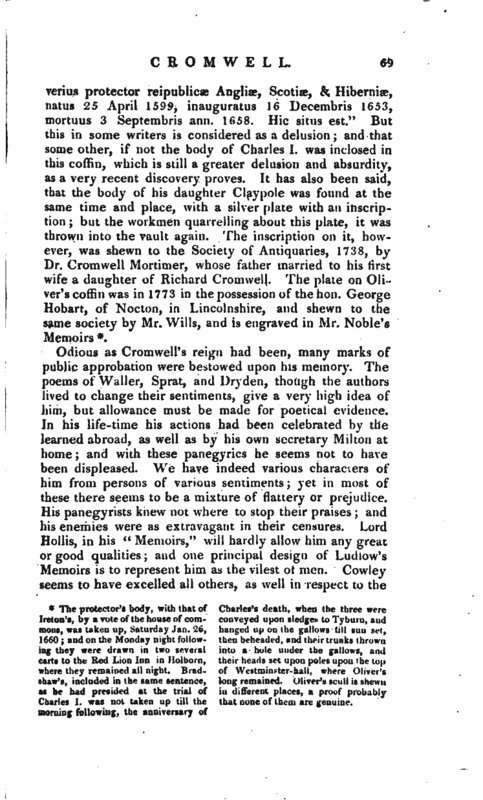 But for the most complete and extensive intelligence, recourse must be had to Mr. Noble’s Memoirs of the Protectoral House of Cromwell, in which will be found not only whatever could well be collected concerning the posterity of the protector, but an account of all the families to which the house of Cromwell was allied, as well as of the principal persons who were distinguished and employed by Olivet during his government. Robert Cromwell, father of the protector, was settled at Huntingdon, and had four sons (including the protector) and seven daughters. Though by the interest of his brother sir Oliver, he was put into the commission of the peace for Huntingdonshire, he had but a slender fortune; most of his support arising from a brewhouse in Huntingdon, chiefly managed by his wife. She was Elizabeth, daughter of a Stewart, of Rothseyth in Fifeshire, and sister of sir Robert Stewart, of the isle of Ely, knt. who has been reported, and not without some foundation of truth, to have been descended from the royal house of Stuart; as appears from a pedigree of her family still in being. Out of the profits of this trade, and her own jointure of 60l. per annum, Mrs. Cromwell | provided fortunes for her daughters, sufficient to marry them into good families. The eldest, or second surviving, was the wife of Mr. John Desborough, afterwards one of the protector’s major-generals; another married, first, Roger Whetstone, esq. 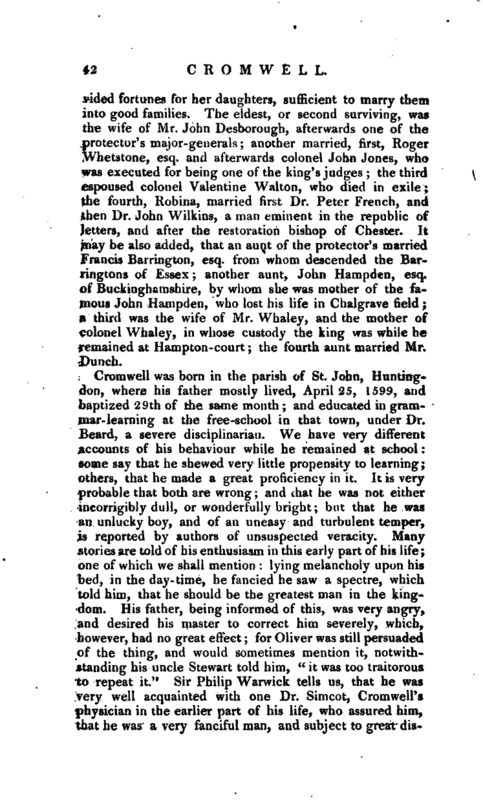 and afterwards colonel John Jones, who was executed for being one of the king’s judges; the third espoused colonel Valentine Walton, who died in exile; the fourth, Robina, married first Dr. Peter French, and then Dr. John Wilkins, a man eminent in the republic of letters, and after the restoration bishop of Chester. 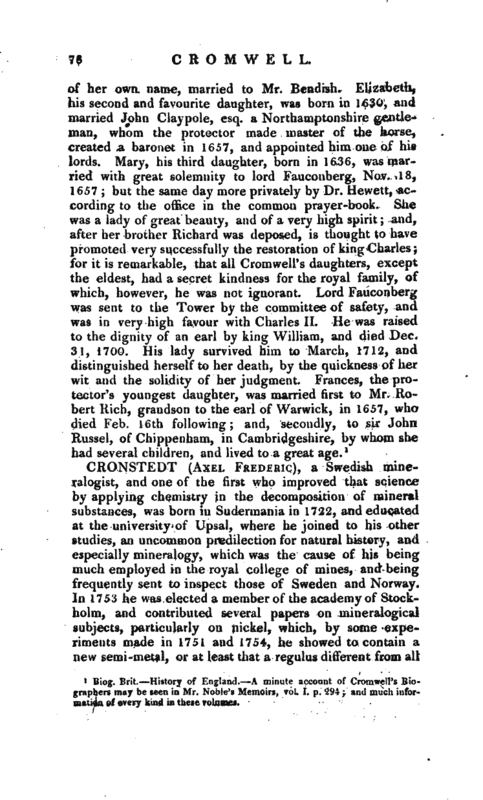 It may be also added, that an aunt of the protector’s married Francis Barrington, esq. from whom descended the Barringtons of Essex; another aunt, John Hampden, esq. of Buckinghamshire, by whom she was mother of the famous John Hampden, who lost his life in Chalgrave field; a third was the wife of Mr. Whaley, and the mother of colonel Whaley, in whose custody the king was while he remained at Hampton-court; the fourth aunt married Mr. Dunch. Cromwell was born in the parish of St. John, Huntingdon, where his father mostly lived, April 25, 1599, and baptized 29th of the same month; and educated in grammar-learning at the free-school in that town, under Dr. Beard, a severe disciplinarian. We have very different accounts of his behaviour while he remained at school: some say that he shewed very little propensity to learning; others, that he made a great proficiency in it. It is very probable that berth are wrong; and that he was not either incorrigibly dull, or wonderfully bright; but that he was an unlucky boy, and of an uneasy and turbulent temper, is reported by authors of unsuspected veracity. Many stories are told of his enthusiasm in this early part of his life; one of which we shall mention: lying melancholy upon his bed, in the day-time, he fancied he saw a spectre, which told him, that he should be the greatest man in the kingdom. His father, being informed of this, was very angry, and desired his master to correct him severely, which, however, had no great effect; for Oliver was still persuaded of the thing, and would sometimes mention it, notwithstanding his uncle Stewart told him, “it was too traitorous to repeat it.” Sir Philip Warwick tells us, that he was very well acquainted with one Dr. Simcot, Cromwell’s physician in the earlier part of his life, who assured him, that he was a very fanciful man, and subject to great | disorders of imagination: and it is. certain, that he was not altogether free from these fits during his whole life, not even in the height of his prosperity. From Huntingdon he was removed to Sidney college in Cambridge, where he was admitted fellow-commoner, April 23, 1616. The entry of his admission is in these words “Oliverus Cromwell, Huntingdonensis, admissus ad commeatum sociorum coll. Siden. Aprilis 23, 1616; tutore M. Kicardo Howlet.” We have very different accounts of the progress he made in his studies while a member of the university. It is certain that he was acquainted with Greek and Roman history; but whether he acquired this knowledge at Cambridge, is a point that may be doubted; since, as several writers inform us, he spent much of his time there at foot-ball, cricket, and other robust exercises, for his skill and expertness in which he was famous. His father dying about two years after he had been at college, he returned home; where the irregularity of his conduct so disturbed his mother, that, by the advice of friends, she sent him to London, and placed him in Lincoln’s-inn. But here, instead of applying to the study of the law, he gave himself up to wine, women, and play; so that he quickly dissipated what his father had left him. 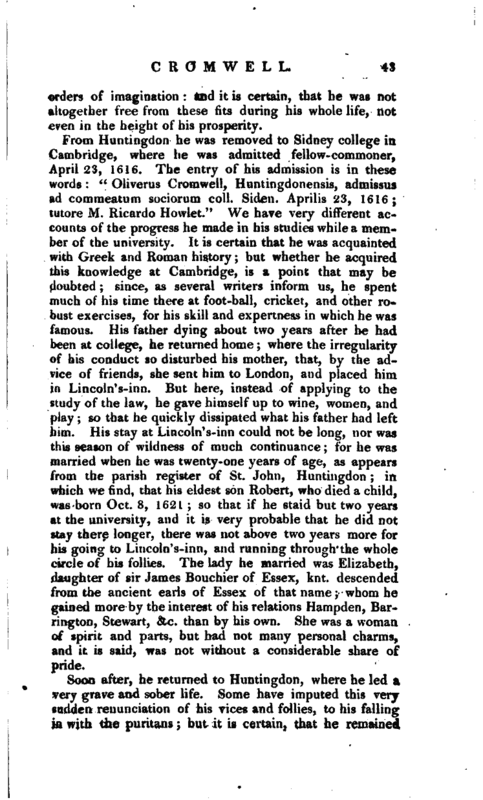 His stay at Lincoln’s-inn could not be long, nor was this season of wildness of much continuance; for he was married when he was twenty-one years of age, as appears from the parish register of St. John, Huntingdon; in which we find, that his eldest son Robert, who died a child, was born Oct. 8, 1621; so that if he staid but two years at the university, and it is very probable that he did not stay there longer, there was not above two years more for his going to Lincoln’s-inn, and running through the whole circle of his follies. The lady he married was Elizabeth, daughter of sir James Bouchier of Essex, knt. descended from the ancient earls of Essex of that name; whom he gained more by the interest of his relations Hampden, Barrington, Stewart, &c. than by his own. She was a woman of spirit and parts, but had not many personal charms, and it is said, was not without a considerable share of pride. Soon after, he returned to Huntingdon, where he led a very grave and sober life. Some have imputed this very sudden renunciation of his vices and follies, to his falling in with the puritans; but it is certain, that he remained | then, and for some time after, a zealous member of the church of England, and entered into a close friendship with several eminent divines. He continued at Huntingdon till an estate of above 400l. 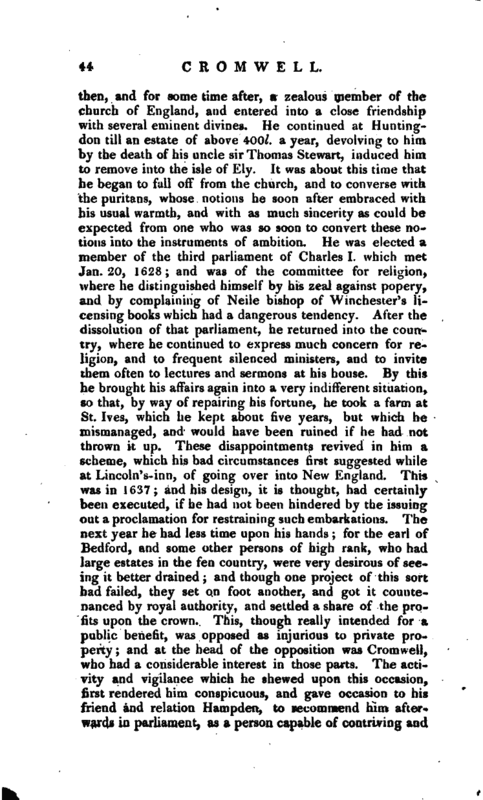 a year, devolving to him by the death of his uncle sir Thomas Stewart, induced him to remove into the isle of Ely. It was about this time that he began to fall off from the church, and to converse with the puritans, whose notions he soon after embraced with his usual warmth, and with as much sincerity as could be expected from one who was so soon to convert these notions into the instruments of ambition. He was elected a member of the third parliament of Charles I. which met Jan. 20, 1628; and was of the committee for religion, where he distinguished himself by his zeal against popery, and by complaining of Neile bishop of Winchester’s licensing books which had a dangerous tendency. After the dissolution of that parliament, he returned into the country, where he continued to express much concern for religion, and to frequent silenced ministers, and to invite them often to lectures and sermons at his house. By this he brought his affairs again into a very indifferent situation, so that, by way of repairing his fortune, he took a farm at St. Ives, which he kept about five years, but which he mismanaged, and would have been ruined if he had not thrown it up. These disappointments revived in him a scheme, which his bad circumstances first suggested while at Lincoln’s-inn, of going over into New England. This was in 1637; and his design, it is thought, had certainly been executed, if he had not been hindered by the issuing out a proclamation for restraining such embarkations. The next year he had less time upon his hands; for the earl of Bedford, and some other persons of high rank, who had large estates in the fen country, were very desirous of seeing it better drained; and though one project of this sort had failed, they set on foot another, and got it countenanced by royal authority, and settled a share of the profits upon the crown. This, though really intended for a public benefit, was opposed as injurious to private property; and at the head of the opposition was Cromuell, who had a considerable interest in those parts. The activity and vigilance which he shewed upon this occasion, first rendered him conspicuous, and gave occasion to his friend and relation Hampden, to recommend him afterwards in parliament, as a person capable of contriving and | conducting great things. Notwithstanding this, he was not very successful in his opposition, and, as his private affairs were still declining, he was in a very necessitous condition at the approach of the long parliament. 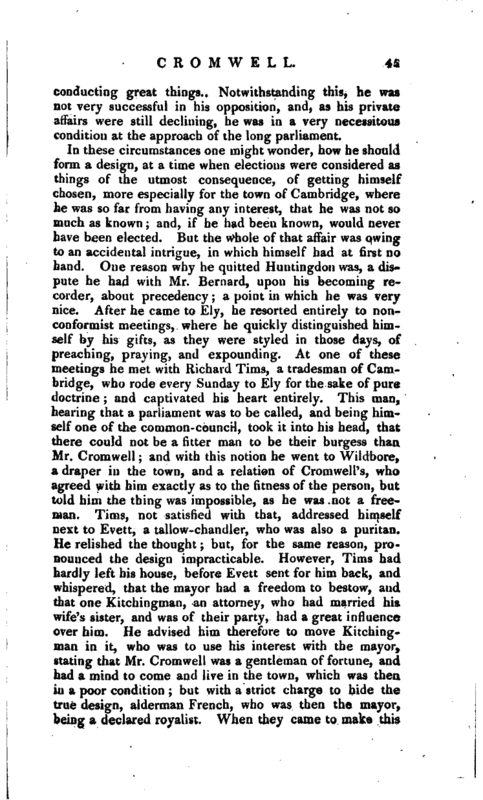 In these circumstances one might wonder, how he should form a design, at a time when elections were considered as things of the utmost consequence, of getting himself chosen, more especially for the town of Cambridge, where he was so far from having any interest, that he was not so much as known; and, if he had been known, would never have been elected. But the whole of that affair was owinor to an accidental intrigue, in which himself had at first no hand. One reason why he quitted Huntingdon was, a dispute he had with Mr. Bernard, upon his becoming recorder, about precedency; a point in which he was very nice. After he came to Ely, he resorted entirely to nonconformist meetings, where he quickly distinguished himself by his gifts, as they were styled in those days, of preaching, praying, and expounding. At one of these meetings he met with Richard Tims, a tradesman of Cambridge, who rode every Sunday to Ely for the sake of pure doctrine; and captivated his heart entirely. This man, hearing that a parliament was to be called, and being himself one of the common-council, took it into his head, that there could not be a fitter man to be their burgess than Mr. Cromwell; and with this notion he went to Wildbore, a draper in the town, and a relation of Cromwell’s, who agreed with him exactly as to the fitness of the person, but told him the thing was impossible, as he was not a freeman. Tims, not satisfied with that, addressed himself next to Evett, a tallow-chandler, who was also a puritan. He relished the thought; but, for the same reason, pronounced the design impracticable. However, Tims had hardly left his house, before Evett sent for him back, and whispered, that the mayor had a freedom to bestow, and that one Kitchingman, an attorney, who had married his wife’s sister, and was of their party, had a great influence over him. He advised him therefore to move Kitchingman in it, who was to use his interest with the mayor, stating that Mr. Cromwell was a gentleman of fortune, and had a mind to come and live in the town, which was then in a poor condition; but with a strict charge to hide the true design, alderman French, who was then the mayor, being a declared royalist. When they came to make this | application to him, French said he was sorry, but that in reality they came too late, for he had promised his freedom to the king’s fisherman. Kitchingman easily removed this objection, by undertaking that the town should confer a freedom upon the person he mentioned; and accordingly at the next court-day, the mayor declared his intention to bestow his freedom on a very worthy gentleman of the isle of Ely, one Mr. Cromwell; who, being apprized of his friend’s industry, came to town over night, and took up his lodgings at Almond’s, a grocer. 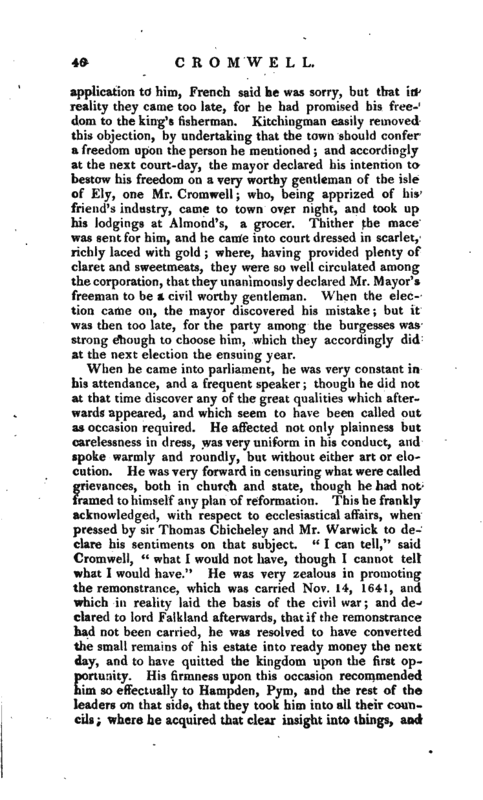 Thither the mace was sent for him, and he came into court dressed in scarlet, richly laced with gold; where, having provided plenty of claret and sweetmeats, they were so well circulated among the corporation, that they unanimously declared Mr. Mayor’s freeman to be a civil worthy gentleman. When the election came on, the mayor discovered his mistake; but it was then too late, for the party among the burgesses was strong enough to choose him, which they accordingly did at the next election the ensuing year. 1642, Cromwell shewed his activity, by going immediately to Cambridge; where he soon raised a troop of horse, of which himself was appointed commander. 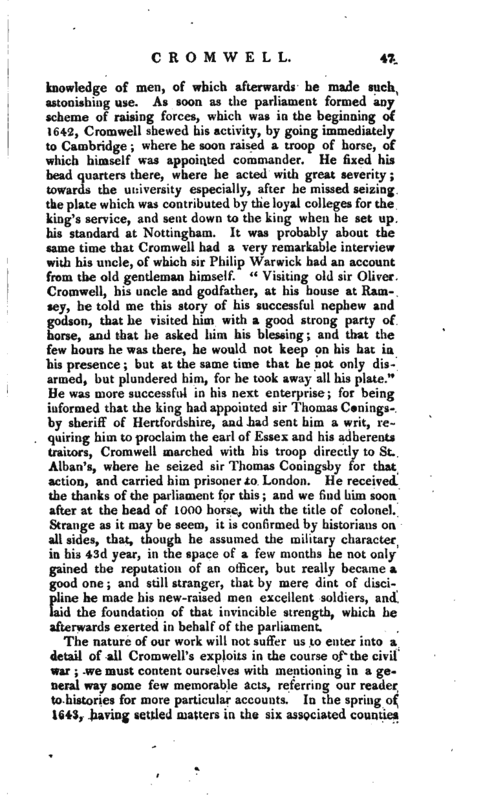 He fixed his head quarters there, where he acted with great severity; towards the university especially, after he missed seizing the plate which was contributed by the loyal colleges for the king’s service, and sent down to the king when he set up his standard at Nottingham. It was probably about the same time that Cromwell had a very remarkable interview with his uncle, of which sir Philip Warwick had an account from the old gentleman himself. “Visiting old sir Oliver Cromwell, his uncle and godfather, at his house at Ramsey, he told me this story of his successful nephew and godson, that he visited him with a good strong party of horse, and that he asked him his blessing; and that the few hours he was there, he would not keep on his hat in his presence; but at the same time that he not only disarmed, but plundered him, for he took away all his plate.” He was more successful in his next enterprise; for being informed that the king had appointed sir Thomas Coningsby sheriff of Hertfordshire, and had sent him a writ, requiring him to proclaim the earl of Essex and his adherents traitors, Cromwell marched with his troop directly to St. Alban’s, where he seized sir Thomas Coningsby for that action, and carried him prisoner to London. He received the thanks of the parliament for this; and we find him soon after at the head of 1000 horse, with the title of colonel. Strange as it may be seem, it is confirmed by historians on all sides, that, though he assumed the military character in his 43d year, in the space of a few months he not only gained the reputation of an officer, but really became a good one; and still stranger, that by mere dint of discipline he made his new-raised men excellent soldiers, and laid the foundation of that invincible strength, which he afterwards exerted in behalf of the parliament. 1643, having settled matters in the six associated counties | of Essex, Hertford, Norfolk, Suffolk, Cambridge, Huntingdon, he advanced into Lincolnshire, where he did great service by restraining the king’s garrison at Newark, giving a check to the earl of Newcastle’s troops at Horncastle, and performing many other services, which increased his credit with the parliament. 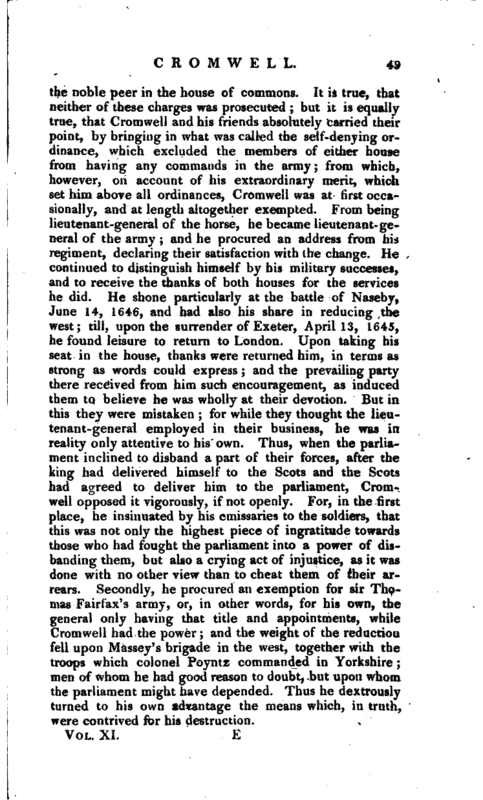 The Scots having been invited to England by the parliament, it was judged highly requisite that the army under the earl of Manchester anil Cromwell, who was now declared lieutenant-general of the horse, should join them, the better to enabie them to reduce York, which they had closely besieged. This service was performed with great vigour and diligence, especially by Cromwell; for though the earl had the title, the power was chiefly in Cromwell; and things were so clextrously managed between him and his friends at Westminster, that, as they knew they might depend upon him, they took care to put as much in his hands as they could. Ih the battle of Marston-moor, fought July 3, 1644, it is unanimously agreed, that Cromwell’s cavalry, who were commonly styled Ironsides, changed the fortune of the day, as that battle did of the war; for the king’s affairs declined, and the parliament’s flourished ever after. Some, however, though they allow this readily to Cromwell’s forces, have yet represented him as acting in a pitiful cowardly manner, and so terrified, as even to run away: but allowance must be made for the relators. It is certain, that on the 19th of the same month he stormed the earl of ‘Exeter’s fine house at Burleigh; and no man’s courage, conduct, and services, were more valued at London. He was also in the second battle at Newbury, Sept. 17, in the same year, and is said to have made so bold a charge with his horse upon the guards, that his majesty’s person had been in the utmost danger, if the old earl of Cleveland had not come in to his relief, and preserved his master’s liberty at the expence of his own. And in the winter, when the disputes in parliament ran higher than, ever, nothing but Cromwell’s merit and good fortune were taiked of by his party; some of whom even styled him the saviour of the nation. Soon after this, a new party sprung up among the soldiers, under the title of Levellers, who made no secret of their hating equally both king and parliamentand it was to save himself from these people, who, as he was informed by Cromwell, sought his life, that the king, Nov. 11, fled from Hampton-court to the Isle of Wight, after having rejected the parliament’s proposals by Cromwell’s and Ireton’s advice. 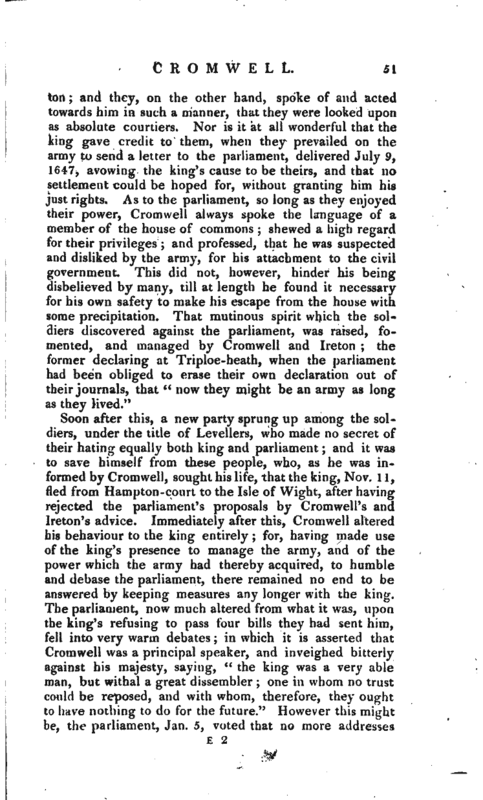 Immediately after this, Cromwell altered his behaviour to the king entirely; for, having made use of the king’s presence to manage the army, and of the power which the army had thereby acquired, to humble and debase the parliament, there remained no end to be answered by keeping measures any longer with the king. The parliament, now much altered from what it was, upon the king’s refusing to pass four bills they had sent him, fell into very warm debates; in which it is asserted that Cromwell was a principal speaker, and inveighed bitterly against his majesty, saying, “the king was a very able man, but withal a great dissembler; one in whom no trust could be reposed, and with whom, therefore, they ought to have nothing to do for the future.” However this might be, the parliament, Jan. 5, voted that no more addresses | should be made to the king; and from that time he was more strictly imprisoned than ever. In the mean time, there were risings in several parts of the kingdom; which employing the military power, the city of London and the parliament were left in some measure at liberty to pursue their own sentiments; and what these were, quickly appeared; for on June 27, 1648, the city petitioned for a personal treaty with the king, which was very well received, and some steps taken to advance it. A few days after, the commons recalled their vote for non-addresses, began a personal treaty with the king at the Isle of Wight, and at length voted his majesty’s concessions satisfactory, and an attempt was even made to impeach Cromwell of high treason. But the army having now reduced all opposition, and returning towards London, Nov. 20, sent a remonstrance to the house of commons, disapproving all they had done. The remonstrance was carried by colonel Ewers, who went next into the isle of Wight, where he seized the person of the king, and carried him to Hurst castle. 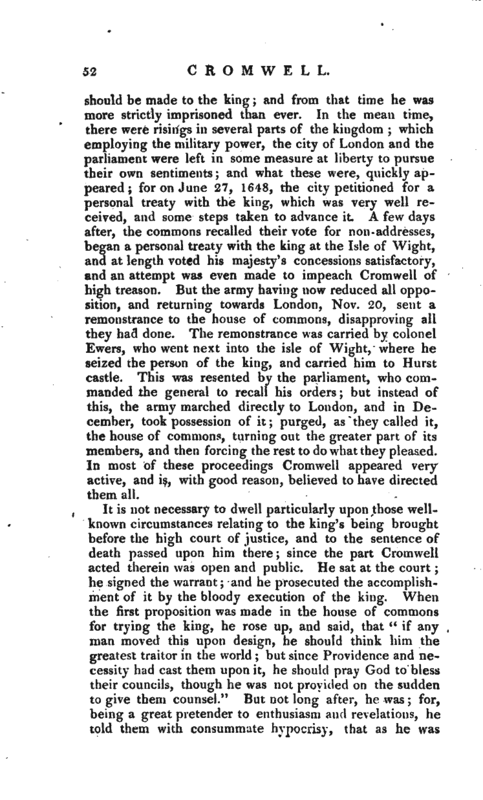 This was resented by the parliament, who commanded the general to recall his orders; but instead of this, the army marched directly to London, and in December, took possession of it; purged, as they called it, the house of commons, turning out the greater part of its members, and then forcing the rest to do what they pleased. In most of these proceedings Cromwell appeared veryactive, and is, with good reason, believed to have directed them all. 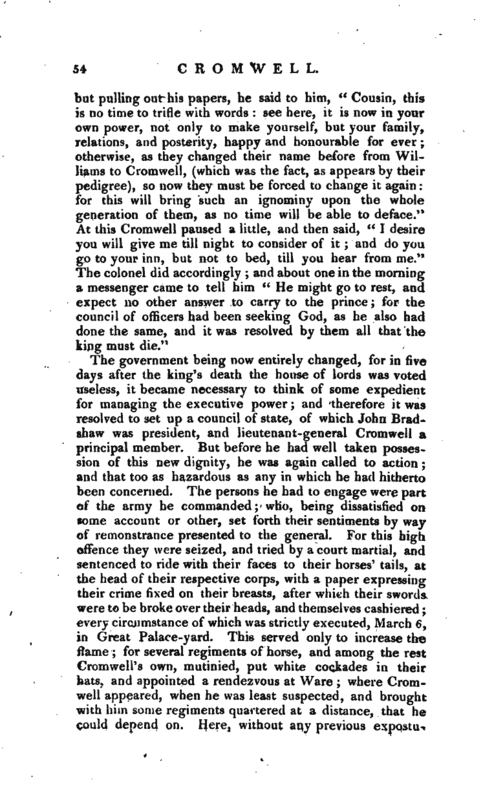 It is not necessary to dwell particularly upon those wellknown circumstances relating to the king’s being brought before the high court of justice, and to the sentence of death passed upon him there; since the part Cromwell acted therein was open and public. He sat at the court; he signed the warrant; and he prosecuted the accomplishment of it by the bloody execution of the king. When the first proposition was made in the house of commons for trying the king, he rose up, and said, that “if any man moved this upon design, he should think him the greatest traitor in the world; but since Providence and necessity had cast them upon it, he should pray God to bless their councils, though he was not provided on the sudden to give them counsel.” But not long after, he was; for, being a great pretender to enthusiasm and revelations, he told them with consummate hypocrisy, that as he was | praying for a blessing from God on his undertaking to restore the king to his pristine majesty, his tongue cleaved to the roof of his mouth, that he could not speak one word more; which he took as a return of prayer, that God had rejected him from being king. Many applications were made to Cromwell for saving the king’s life; and some of the passages relating to them are worth notice. 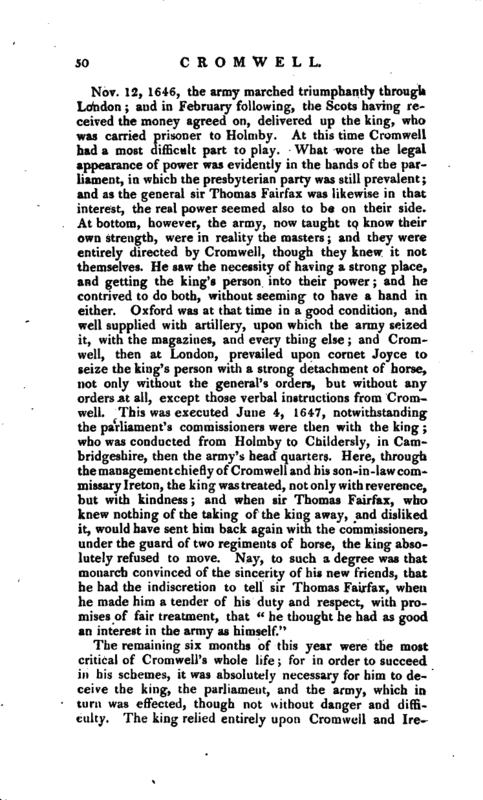 One of the most remarkable, which greatly illustrates the character of the man, is the transaction between the lieutenantgeneral and a cousin of his, colonel John Cromwell, an officer in the service of the States. This gentleman is said to have been in England while the king was in the hands of the army; and that, in a conference he had with the lieutenant-general, the latter made use of this expression, u I think the king the most injured prince in the world;“and then, clapping his hand upon his sword, added,” But this, cousin, shall do him right.“The colonel returning to Holland soon after, reported what he took to be truth, that the lieutenant-general had a great respect for the king. When therefore the news of the king’s trial reached Holland, he was sent over with letters credential from the States, to which was added a blank with the king’s signet, and another of the prince’s, both confirmed by the States, for Cromwell to set down his own conditions, if he would now save his majesty’s life. The colonel went directly to his kinsman’s house; who was so retired and shut up in his chamber, with an order to let none know he was at home, that it was with much difficulty he obtained admittance, after he had declared who he was. Having mutually saluted each other, the colonel desired to speak a few words with him in private; and began with much freedom to set before him the heinousness of the fact then about to be committed, and with what detestation it was looked upon abroad; telling him, that” of all men living he could never have imagined he would have had any hand in it, who in his hearing had protested so much for the king.“To this Cromwell answered,” It was not he, but the army; and though he did once say some such words, yet now times were altered, and Providence seemed to order things otherwise.“And it is said he added, that” he had prayed and tasted for the king, but no return that way was yet made to him.“Upon this the colonel stepped a little back, and Suddenly shut the door, which made Cromwell apprehend he was going to be assassinated; | but pulling out his papers, he said to him,” Cousin, this, is no time to trifle with words: see here, it is now in your own power, not only to make yourself, but your family, relations, and posterity, happy and honourable for ever; otherwise, as they changed their name before from Williams to Cromwell, (which was the fact, as appears by their pedigree), so now they must be forced to change it again: for this will bring such an ignominy upon the whole generation of them, as no time will he able to deface.“At this Cromwell paused a little, and then said,” I desire you will give me till night to consider of it; and do yuu go to your inn, but not to bed, till you hear from me.“The colonel did accordingly; and about one in the morning a messenger came to tell him” He might go to rest, and expect no other answer to carry to the prince; for the council of officers had been seeking God, as he also had done the same, and it was resolved by them all that the king must die." 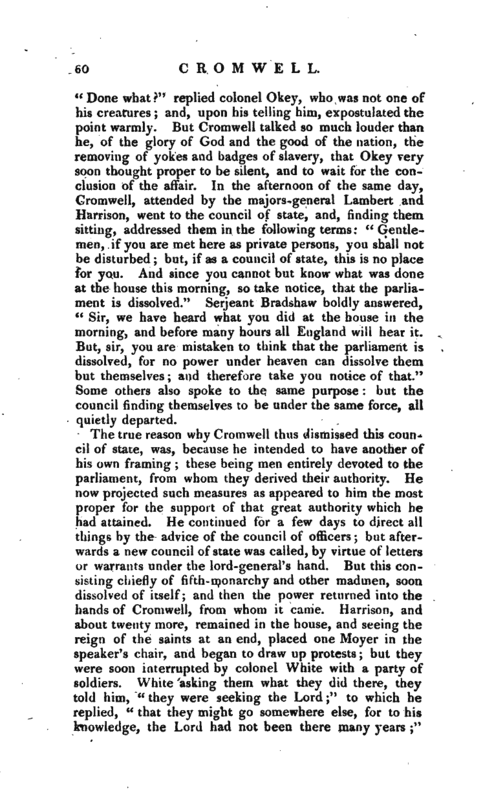 The government being now entirely changed, for in five days after the king’s death the house of lords was voted useless, it became necessary to think of some expedient for managing the executive power; and therefore it was resolved to set up a council of state, of which John Bradshaw was president, and lieutenant-general Cromwell a principal member. But before he had well taken possession of this new dignity, he was again called to action; and that too as hazardous as any in which he had hitherto been concerned. The persons he had to engage were part of the army he commanded; who, being dissatisfied on some account or other, set forth their sentiments by way of remonstrance presented to the general. For this high offence they were seized, and tried by a court martial, and sentenced to ride with their faces to their horses’ tails, at the head of their respective corps, with a paper expressing their crime fixed on their breasts, after which their swords were to be broke over their heads, and themselves cashiered; every circumstance of which was strictly executed, March 6, in Great Palace-yard. 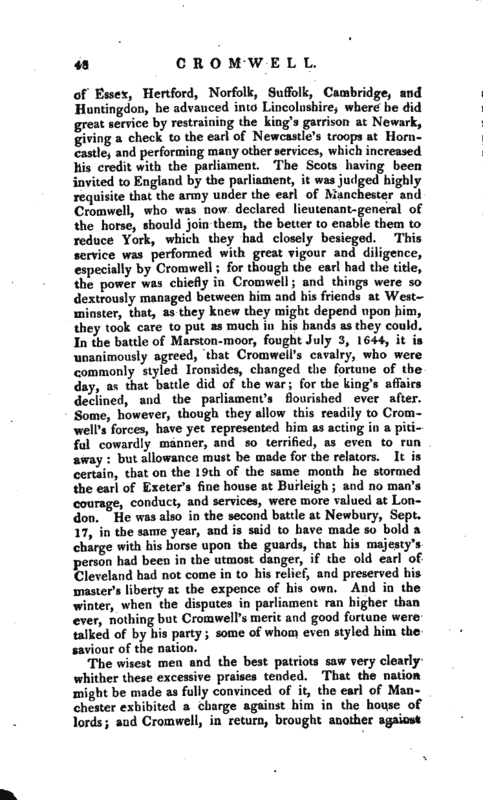 This served only to increase the flame; for several regiments of horse, and among the rest Cromwell’s own, mutinied, put white cockades in their hats, and appointed a rendezvous at Ware; where Cromwell appeared, when he was least suspected, and brought with him some regiments quartered at a distance, that he couicl depend on. Here, without any previous | expostulations, he with two regiments of horse surrounded one regiment of the mutineers, and calling four men by name out of their ranks, obliged them to cast dice for their lives; and the two that escaped were ordered to shoot the others, which they did; upon which the rest thought fit to slip their white cockades into their pockets, and to secure themselves by a submission. The same spirit of mutiny broke out in another regiment of horse; but it was entirely subdued by Cromwell, and the fomenters of it punished. 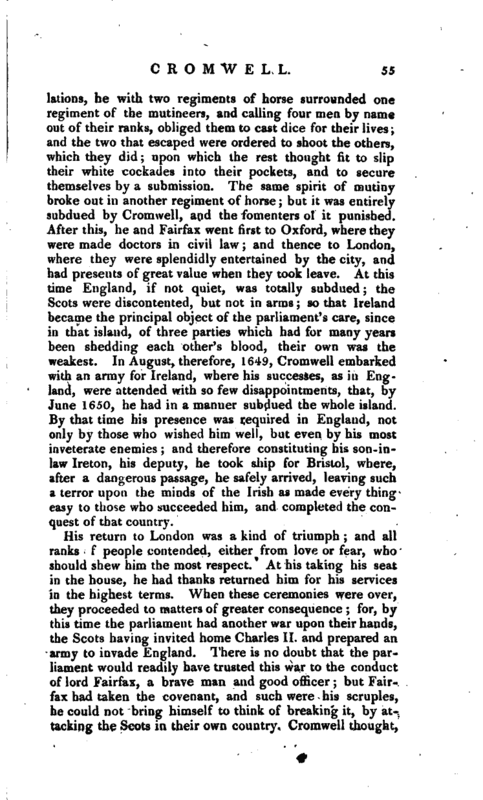 After this, he and Fairfax went first to Oxford, where they were made doctors in civil law; and thence to London, where they were splendidly entertained by the city, and had presents of great value when they took leave. At this time England, if not quiet, was totally subdued; the Scots were discontented, but not in arms; so that Ireland became the principal object of the parliament’s care, since in that island, of three parties which had for many years been shedding each other’s blood, their own was the weakest. In August, therefore, 1649, Cromwell embarked with an army for Ireland, where his successes, as in England, were attended with so few disappointments, that, by June 1650, he had in a manner subdued the whole island. By that time his presence was required in England, not only by those who wished him well, but even by his most inveterate enemies; and therefore constituting his son-inlaw Ireton, his deputy, he took ship for Bristol, where, after a dangerous passage, he safely arrived, leaving such a terror upon the minds of the Irish as made every thing easy to those who succeeded him, and completed the conquest of that country. His return to London was a kind of triumph; and all ranks of people contended, either from love or fear, who should shew him the most respect. At his taking his seat in the house, he had thanks returned him for his services in the highest terms. When these ceremonies were over, they proceeded to matters of greater consequence; for, by this time the parliament had another war upon their hands, the Scots having invited home Charles II. and prepared an army to invade England. 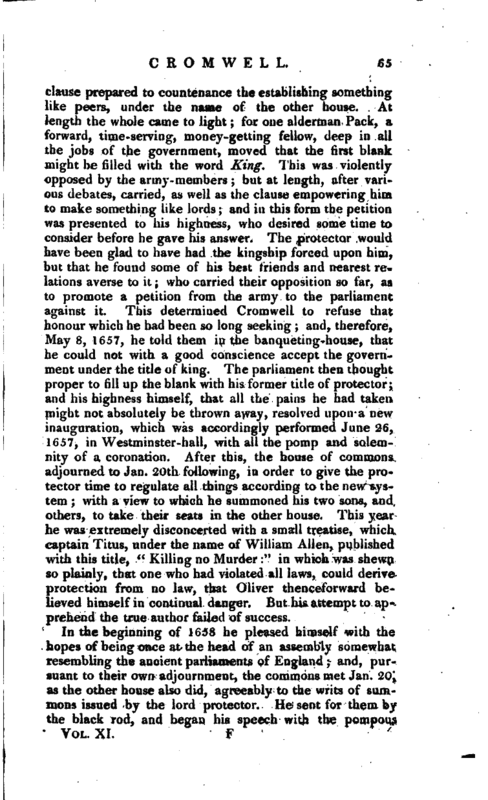 There is no doubt that the parliament would readily have trusted this war to the conduct of lord Fairfax, a brave man and good officer; but Fairfax had taken the covenant, and such were his scruples, he could not bring himself to think of breaking it, by attacking the Scots in their own country. 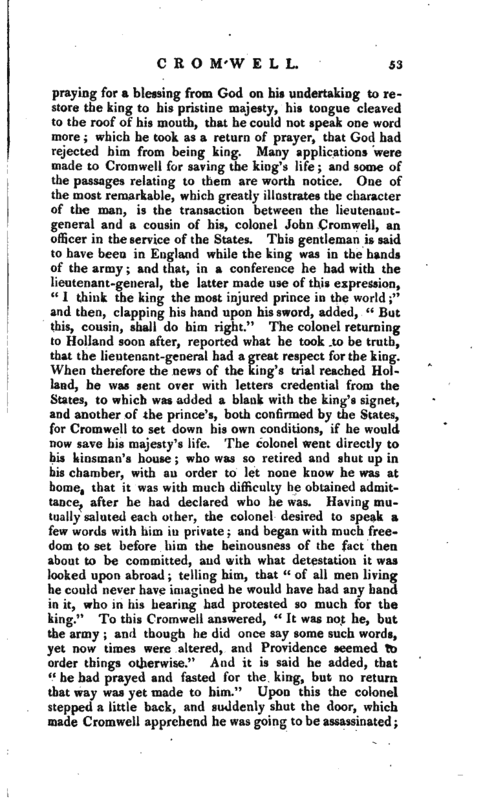 Cromwell thought, | and rightly, that they should not wait for an invasion, but prevent one invasion by another; and therefore pressed Fairfax to continue in his command, and the more earnestly, because he knew he would not do it; declaring that he thought it a greater honour to serve as his lieutenant-general, than to command in chief the finest army in the world. Fairfax, however, remained inflexible in his resolution; so that, June 26, an ordinance passed for repealing his commission, and at the same time another for appointing Cromwell general and commander in chief of all the forces of the commonwealth. He had now such power as might have satisfied the most ambitious mind; for though he offered to resign his lieutenancy of Ireland, the parliament would not accept it. He marched with an army to Scotland, and Sept. 3, gained the victory of Dunbar, than which none ever did him greater credit as a commander. He continued the war all the winter; in the spring was severely attacked by an ague; of which recovering, he, after several successes, forced the king into England, and blocked him up in Worcester. Sept. 3, 165J, he attacked and carried that city, totally defeated the king’s forces, and gained what he himself called, in his letter to the parliament, the crowning victory. It is said, that this signal stroke of success took Cromwell a little off his trnard. 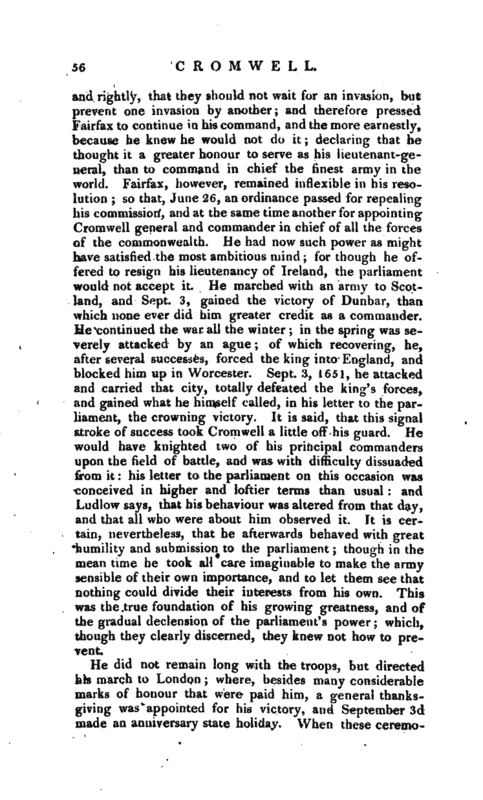 He would have knighted two of his principal commanders upon the field of battle, and was with difficulty dissuaded from it: his letter to the parliament on this occasion was conceived in higher and loftier terms than usual: and Ludlow says, that his behaviour was altered from that day, and that all who were about him observed it. It is certain, nevertheless, that he afterwards behaved with great humility and submission to the parliament; though in the mean time he took all care imaginable to make the army sensible of their own importance, and to let them see that nothing could divide their interests from his own. This was the true foundation of his growing greatness, and of the gradual declension of the parliament’s power; which, though they clearly discerned, they knew not how to prevent. He did not remain long with the troops, but directed his inarch to London; where, besides many considerable marks of honour that were paid him, a general thanksgiving was appointed for his victory, and September 3d made an anniversary state holiday. When these | ceremonies and acknowledgments were over, he had leisure to look about him, and to consider his own condition as well as that of the nation. He saw himself at present general and commander in chief of a great army in England, and at the same time was lord lieutenant of Ireland. But then he knew that all this was derived to him from the parliament; and he clearly discerned, that, whether independents or presbyterians sat there, they would endeavour to perpetuate supreme power in their own hands, which for many reasons he disliked. He therefore sifted the most eminent persons, in order to find out their sentiments about the establishment of the kingdom; which was a new phrase invented to cover the design of subverting the parliament. In a meeting among them, held some time after the battle of Worcester, he proposed the question fairly; when some declared for a monarchy, as others did for a commonwealth: but this conference came to nothing. Nov. 7, 1652, meeting the lord commissioner Whitlocke in the Park, he entered into a long discourse with him upon this important subject: in which he undertook to shew Whitlocke, that the parliament was now become a faction; that they were resolved to ruin all, and to rule for ever, merely for their own sakes; that they gave all employments to themselves, their relations, aud friends that they drew every thing within their own cognizance, by which the subject lost the benefit of the law, and held his property by a precarious tenure; that, all this considered, they had fought themselves into a worse condition; and that, instead of a monarch with a prerogative royal, they had now many masters, who made laws and broke them at their pleasure; that, on the other hand, the army was very sensible of this; that they bore it with great reluctance; that they too had great disputes among themselves: and that it could not be long before those mischiefs broke out into a new flame. 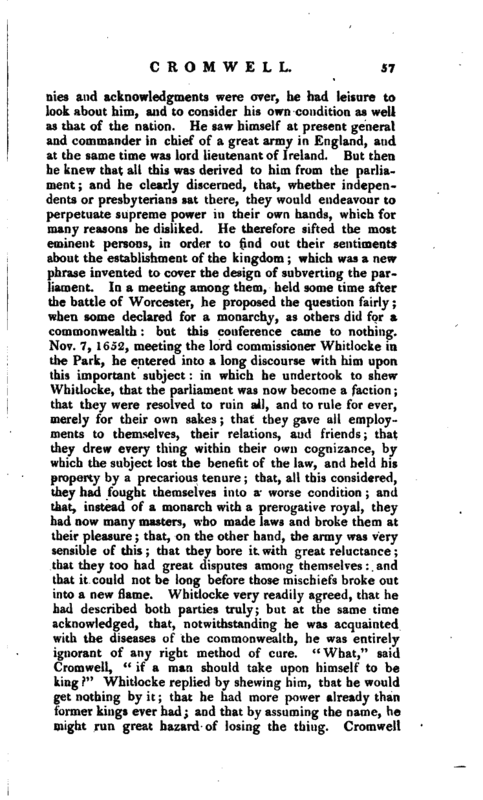 Whitlocke very readily agreed, that he had described both parties truly; but at the same time acknowledged, that, notwithstanding he was acquainted with the diseases of the commonwealth, he was entirely ignorant of any right method of cure. “What,” said Cromwell, “if a man should take upon himself to be king?” Whitlocke replied by shewing him, that he would get nothing by it; that he had more power already than former kings ever had; and that by assuming the name, he might run great hazard of losing the thing, Cromwell | then pressed to know, what he would hare done? 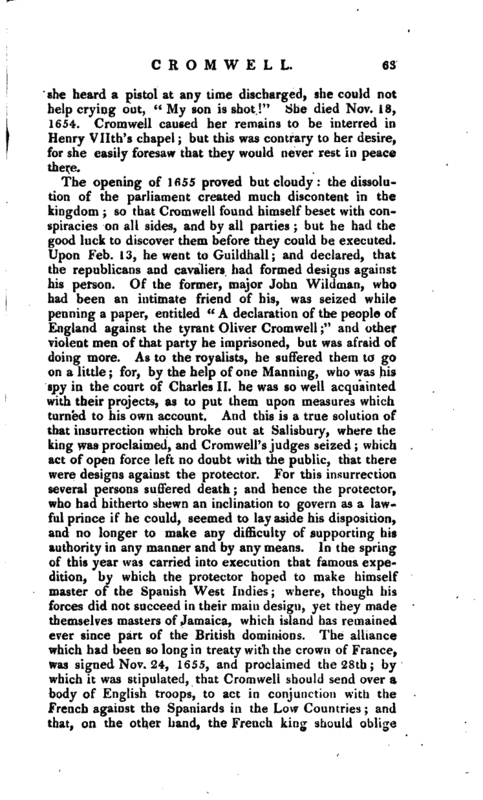 Upon which Whitlocke proposed compromising matters with Charles Stuart: the debating of which Cromwell declined, as an affair of much difficulty. Cromwell had many conversations of this sort with the most intelligent of all parties, none of which diverted him from his secret purpose, to possess himself of the regal power, under some name or other. Notwithstanding this, he behaved in public with great decency and duty towards that body of men he was contriving to remove. The whole winter of 1652 was spent in contrivances and cabals on both sides; by the friends of the parliament to support and maintain its authority, by their opponents to bring things into such a situation, as to render the necessity of dissolving that assembly universally apparent. April 19, 1653, Cromwell called a council of officers once more to debate this point; in which, as he had many friends, so he had also some opponents, who insinuated, that what he did proceeded from self-interest and ambition. Major-general Harrison, a zealous fanatic, but absolutely deceived by Cromwell, assured the assembly, in the sincerity of his heart, that “the lord-general sought only to pave the way for the government of Jesus and his saints;” to which major Streater briskly returned, that “then he ought to come quickly; for if it was after Christmas, he would come too late.” Upon this, Cromwell adjourned the meeting till the next morning, when a new point was started, whether it might not be expedient for the house and the army to appoint twenty persons on a title to be intrusted with the supreme power? 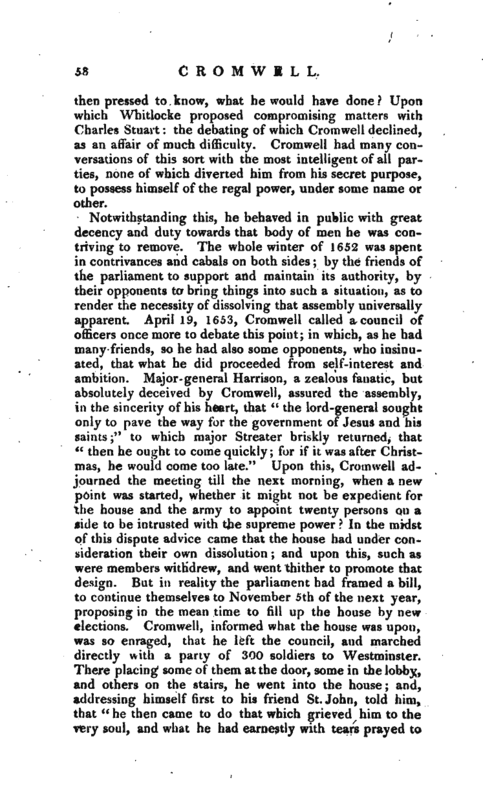 In the midst of this dispute advice came that the house had under consideration their own dissolution; and upon this, such as were members withdrew, and went thither to promote that design. But in reality the parliament had framed a bill, to continue themselves to November 5th of the next year, proposing in the mean time to fill up the house by new elections. Cromwell, informed what the house was upon, was so enraged, that he left the council, and marched directly with a party of 300 soldiers to Westminster. There placing some of them at the door, some in the lobby, and others on the stairs, he went into the house; and, addressing himself first to his friend St. John, told him, that “he then came to do that which grieved him to the very soul, and what he had earnestly with tears prayed to | God against; nay, that he had rather be torn in pieces than do it; but that there was a necessity laid upon him tilt-rein, in order to the glory of God, and the good of the nation.” Then he sat down, and heard their debates for some time on the forementioned bill; after which, calling to major-general Harrison, who was on the other side of the house, to come to him, he told him, that “he judged the parliament ripe for a dissolution, and this to be the time of doing it.” Harrison answered, “Sir, the work is very great and dangerous; therefore I desire you seriously to consider of it before you engage in it.” “You say well,” replied Cromwell; and thereupon sat still for about a quarter of an hour. Then the question being put for passing the said bill, he declared again to Harrison, “This is the time, I must do it:” and so standing up of a sudden, he bade the speaker leave the chair, and told the house that they had sat long enough, unless they had done more good; that some of them were whoremasters, others drunkards, others corrupt and unjust men, and scandalous to the profession of the gospel; that it was not fit they should sit as a parliament any longer, and therefore he must desire them to go away. He charged them with not having a heart to do any thing for the public good, and with being the supporters of tyranny and oppression. When some of the members began to speak, he stepped into the midst of the house, and said, “Come, come, I will put an end to your prating:” then walking up and down the house, he cried out, “You are no parliament, I say, you are no parliament;” and stamping with his feet, he bid them for shame be gone, and give place to honester men. Upon this signal the soldiers entered the house, and he bade one of them take away that bauble, pointing to the mace; and Harrison taking the speaker by the hand, he came down. Then Cromwell, addressing himself again to the members, who were about an hundred, said, ‘ 4 ’Tis you that have forced me to this; for I have sought the Lord night and day, that he would rather slay me, than put me upon the doing of iliis work.“And then seizing on all their papers, he ordered the soldiers to see the house cleared of all members; and having caused the doors to be locked up, went away to Whitehall. Here he found a council oi’oiHcers still assembled, and this grand point yet in debate: upon which he told them roundly,” thev need trouble themselves no farther about it, for he had done it.“| ”Done what?“replied colonel Okey, who was not one of his creatures; and, upon his telling him, expostulated the point warmly. But Cromwell talked so much louder than he, of the glory of God and the good of the nation, the removing of yokes and badges of slavery, that Okey very soon thought proper to be silent, and to wait for the conclusion of the affair. In the afternoon of the same day, Cromwell, attended by the majors-general Lambert and Harrison, went to the council of state, and, finding them sitting, addressed them in the following terms:” Gentlemen, if you are met here as private persons, you shall not be disturbed; but, if as a council of state, this is no place for you. And since you cannot but know what was done at the house this morning, so take notice, that the parliament is dissolved.“Serjeant Bradshaw boldly answered,” Sir, we have heard what you did at the house in the morning, and before many hours all England will hear it. But, sir, you are mistaken to think that the parliament is dissolved, for no power under heaven can dissolve them but themselves; and therefore take you notice of that." Some others also spoke to the same purpose: but the council finding themselves to be under the same force, all quietly departed. The true reason why Cromwell thus dismissed this council of state, was, because he intended to have another of his own framing; these being men entirely devoted to the parliament, from whom they derived their authority. He now projected such measures as appeared to him the most proper for the support of that great authority which he had attained. He continued for a few days to direct all things by the advice of the council of officers; but afterwards a new council of state was called, by virtue of letters or warrants under the lord-general’s hand. But this consisting chiefly of fifth-monarchy and other madmen, soon dissolved of itself; and then the power returned into the hands of Cromwell, from whom it came. 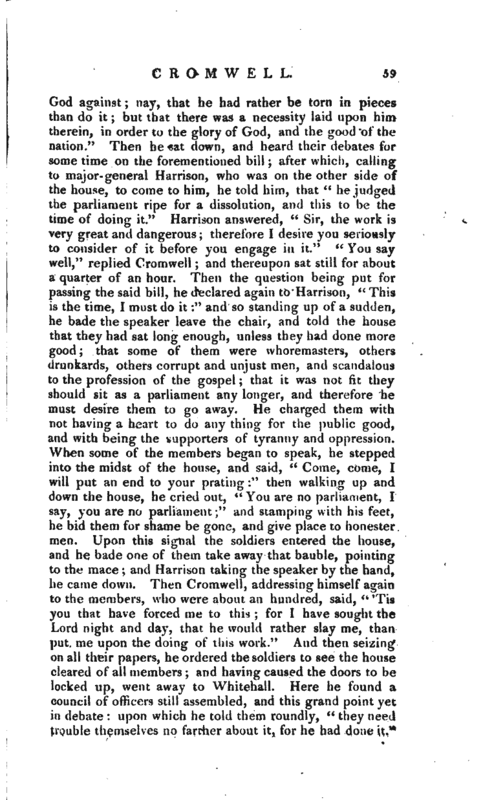 Harrison, and about twenty more, remained in the house, and seeing the reign of the saints at an end, placed one Moyer in the speaker’s chair, and began to draw up protests; but they were soon interrupted by colonel White with a party of soldiers. White asking them what they did there, they told him, “they were seeking the Lord;” to which he replied, “that they might go somewhere else, for to his knowledge, the Lord had not been there many years;” | and so turned them out of doors. 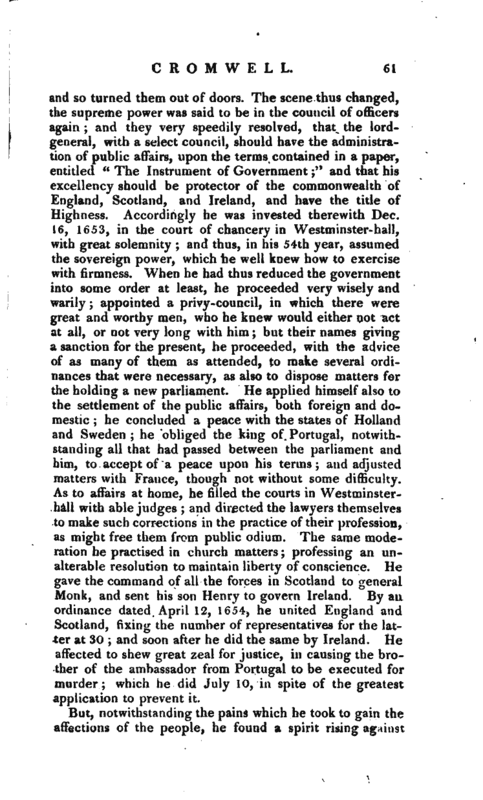 The scene thus changed, the supreme power was said to be in the council of officers again; and they very speedily resolved, that the lordgeneral, with a select council, should have the administration of public affairs, upon the terms contained in a paper, entitled “The Instrument of Government;” and that his excellency should be protector of the commonwealth of England, Scotland, and Ireland, and have the title of Highness. Accordingly he was invested therewith Dec. 16, 1653, in the court of chancery in Westminster-hall, with great solemnity; and thus, in his 54th year, assumed the sovereign power, which he well knew how to exercise with firmness. When he had thus reduced the government into some order at least, he proceeded very wisely and warily; appointed a privy-council, in which there were great and worthy men, who he knew would either not act at all, or not very long with him; but their names giving a sanction for the present, he proceeded, with the advice of as many of them as attended, to make several ordinances that were necessary, as also to dispose matters for the holding a new parliament. He applied himself also to the settlement of the public affairs, both foreign and domestic; he concluded a peace with the states of Holland and Sweden; he obliged the king of Portugal, notwithstanding all that had passed between the parliament and bim, to accept of a peace upon his terms; and adjusted matters with France, though not without some difficulty. As to affairs at home, he filled the courts in Westminsterhall with able judges; and directed the lawyers themselves to make such corrections in the practice of their profession, as might free them from public odium. The same moderation he practised in church matters; professing an unalterable resolution to maintain liberty of conscience. He gave the command of all the forces in Scotland to general Monk, and sent his son Henry to govern Ireland. By an ordinance dated April 12, 1654, he united England and Scotland, fixing the number of representatives for the latter at 30; and soon after he did the same by Ireland. He affected to shew great zeal for justice, in causing the brother of the ambassador from Portugal to be executed for murder; which he did July 10, in spite of the greatest application to prevent it. But, notwithstanding the pains which he took to gain the affections of the people, he found a spirit rising against | him in all the three kingdoms; and his government so cramped for want of money, that he was under an absolute necessity of calling a parliament, according to the form which he had prescribed in the Instrument of Government. He fixed Sept. 3 for the day on which they were to assemble, esteeming it particularly fortunate to him; and to this he peremptorily adhered, though it happened to full upon a Sunday. The parliament svas accordingly opened on that day, alter hearing a sermon at Westminster-abbey, to which the protector went in very great state. 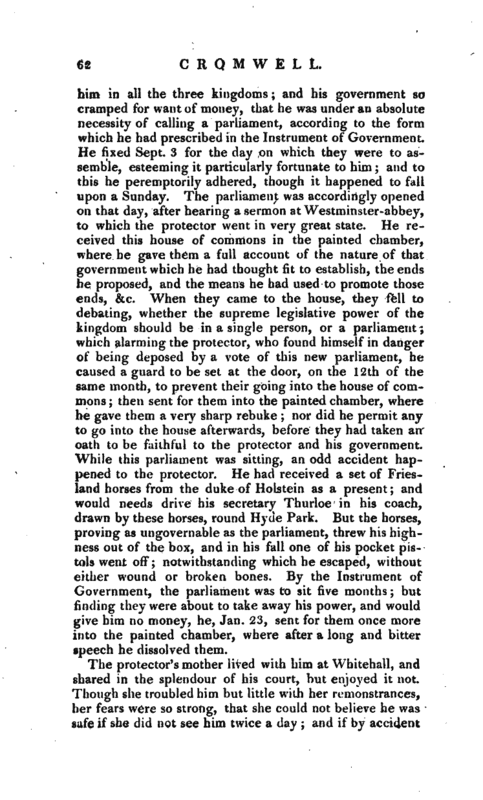 He received this house of commons in the painted chamber, where he gave them a full account of the nature of that government which he had thought fit to establish, the ends he proposed, and the means he had used to promote those ends, &c. When they came to the house, they fell to debating, whether the supreme legislative power of the kingdom should be in a single person, or a parliament; which alarming the protector, who found himself in danger of being deposed by a vote of this new parliament, he caused a guard to be set at the door, on the 12th of the same month, to prevent their going into the house of commons; then sent for them into the painted chamber, where he gave them a very sharp rebuke; nor did he permit any to go into the house afterwards, hefore they had taken an oath to be faithful to the protector and his government. While this parliament was sitting, an odd accident happened to the protector. He had received a set of Friesland horses from the duke of Holstein as a present; and would needs drive his secretary Thurloe in his coach, drawn by these horses, round Hyde Park. But the horses, proving as ungovernable as the parliament, threw his highness out of the box, and in his fall one of his pocket pistols went off; notwithstanding which he escaped, without either wound or broken bones. By the Instrument of Government, the parliament was to sit five months; but finding they were about to take away his power, and would give him no money, he, Jan. 23, sent for them once more into the painted chamber, where after a long and bitter speech he dissolved them. The protector’s mother lived with him at Whitehall, and shared in the splendour of his court, but enjoyed it not. Though she troubled him but little with her remonstrances, her fears were so strong, that she could not believe he was it she did nut see him twice a clay; and if by accident | she heard a pistol at any time discharged, she could not help crying out, “My son is shot!” She died Nov. 18, 1654. Cromwell caused her remains to be interred in Henry Vllth’s chapel; but this was contrary to her desire, for she easily foresaw that they would never rest in peace there. The opening of 1655 proved but cloudy: the dissolution of the parliament created much discontent in the kingdom; so that Cromwell found himself beset with conspiracies on all sides, and by all parties; but he had the good luck to discover them before they could be executed. Upon Feb. 13, he went to Guildhall; and declared, that the republicans and cavaliers had formed designs against his person. Of the former, major John Wildman, who had been an intimate friend of his, was seized while penning a paper, entitled “A declaration of the people of England against the tyrant Oliver Cromwell;” and other violent men of that party he imprisoned, but was afraid of doing more. As to the royalists, he suffered them to go on a little; for, by the help of one Manning, who was his spy in the court of Charles II. he was so well acquainted with their projects, as to put them upon measures which turned to his own account. And this is a true solution of that insurrection which broke out at Salisbury, where the king was proclaimed, and Cromwell’s judges seized; which act of open force left no doubt with the public, that there were designs against the protector. For this insurrection several persons suffered death; and hence the protector, who had hitherto shewn an inclination to govern as a lawful prince if he could, seemed to lay aside his disposition, and no longer to make any difficulty of supporting his authority in any manner and by any means; In the spring of this year was carried into execution that famous expedition, by which the protector hoped to make himself master of the Spanish West Indies; where, though his forces did not succeed in their main design, yet they made themselves masters of Jamaica, which island has remained ever since part of the British dominions. The alliance which had been so long in treaty with the crown of France, was signed Nov. 24, 1655, and proclaimed the 28th; by which it was stipulated, that Cromwell should send over a body of English troops, to act in conjunction with the French agaiust the Spaniards in the Low Countries; and that, on the other hand, the French king should oblige | the royal family to quit his dominions. The new king of Sweden sent over an ambassador to compliment the protector. He was most graciously received; but the intended visit of queen Christina, who had just resigned the crown, he judged proper to avoid. 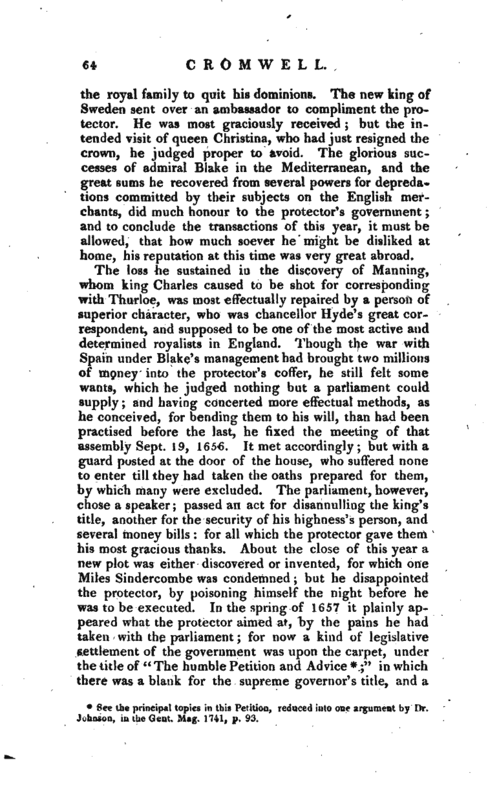 The glorious successes of admiral Blake in the Mediterranean, and the great sums he recovered from several powers for depredations committed by their subjects on the English merchants, did much honour to the protector’s government; and to conclude the transactions of this year, it must be allowed, that how much soever Ire might be disliked at home, his reputation at this time was very great abroad. See the principal topics in this Petition, reduced into one argument by Dr. Johnson, in the —Gent. Mag. 1741, p. 93. | clause prepared to countenance the establishing something like peers, under the name of the other house. At length the whole came to light; for one alderman Pack, a forward, time-serving, money-getting fellow, deep in all the jobs of the government, moved that the first blank might l)e filled with the word King. This was violently opposed by the army-members; but at length, after various debates, carried, as well as the clause empowering him. to make something like lords; and in this form the petition was presented to his highness, who desired some time to consider before he gave his answer. The protector would have been glad to have had the kingship forced upon him, but that he found some of his best friends and nearest relations averse to it; who carried their opposition so far, as to promote a petition from the army to the parliament against it. This determined Cromwell to refuse that honour which he had been so long seeking; and, therefore, May 8, 1657, he told them in the banqueting-house, that he could not with a good conscience accept the government under the title of king. The parliament then thought proper to fill up the blank with his former title of protector; and his highness himself, that all the pains he had taken might not absolutely be thrown away, resolved upon a new inauguration, which was accordingly performed June 26, 1657, in Westminster-hall, with all the pomp and solemnity of a coronation. After this, the house of commons adjourned to Jan. 20th following, in order to give the protector time to regulate all things according to the new system; with a view to which he summoned his two sons, and others, to take their seats in the other house. This year he was extremely disconcerted with a small treatise, which captain Titus, under the name of William Allen, published with this title, “Killing no Murder:” in which w r as shewn so plainly, that one who had violated all laws, could derive protection from no law, that Oliver thenceforward believed himself in continual danger. But his attempt to apprehend the true author failed of success. In the beginning of 1658 he pleased himself with the hopes of being once at the head of an assembly somewhat resembling the ancient parliaments of England; and, pursuant to their own adjournment, the commons met Jan. 20, as the other house also did, agreeably to the writs of summons issued by the lord protector. He sent for them by the black rod, and began his speech with the pompous | words, “My lords, and you the knights, citizens, and burgesses of the house of commons, &.c.” All this only served to shew that his administration was founded in military force, and nothing else: for the ancient nobility would not resume their seats in such company as he had assigned them; and the house of commons would have nothing to do with the new nobles in the other house; and the new nobles could do nothing by themselves. Thus in less than a fortnight the new system was in a fair way of being pulled to pieces, which obliged the protector to come, Feb. 4th, and to dissolve them with great bitterness of speech and sorrow of heart: for now he plainly saw that a regular establishment was a thing impracticable. Some farther designs against him were soon after discovered, not of the cavaliers only, but of the fifth-monarchy men also. With the latter he was obliged to observe some measures; the former he delivered over to a high court of justice. By the sentence of that court, Dr. Hewett, a divine of the church of England, suffered death for contumacy, June 8, 1658; having refused to plead, or to own the jurisdiction of the court. Aug. 6, the protector’s favourite daughter Elizabeth, wife of John Claypole, esq. of Narborough in Northamptonshire, died, which affected him greatly on more accounts than one. 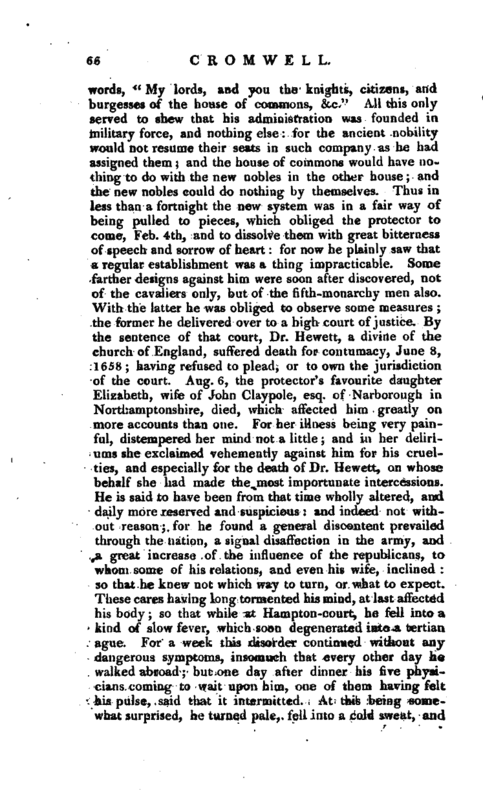 For her illness being very painful, distempered her mind not a little; and in her deliriums she exclaimed vehemently against him for his cruelties, and especially for the death of Dr. Hewett, on whose behalf she had made the most importunate intercessions. He is said to have been from that time wholly altered, and daily more reserved and suspicious: and indeed not without reason; for he found a general discontent prevailed through the nation, a signal disaffection in the army, and a great increase of the influence of the republicans, to whom some of his relations, and even his wife, inclined: so that he knew not which way to turn, or what to expect. These cares having long tormented his mind, at last affected his body; so that while at Hampton-court, he fell into a kind of slow fever, which soon degenerated into a tertian ague. 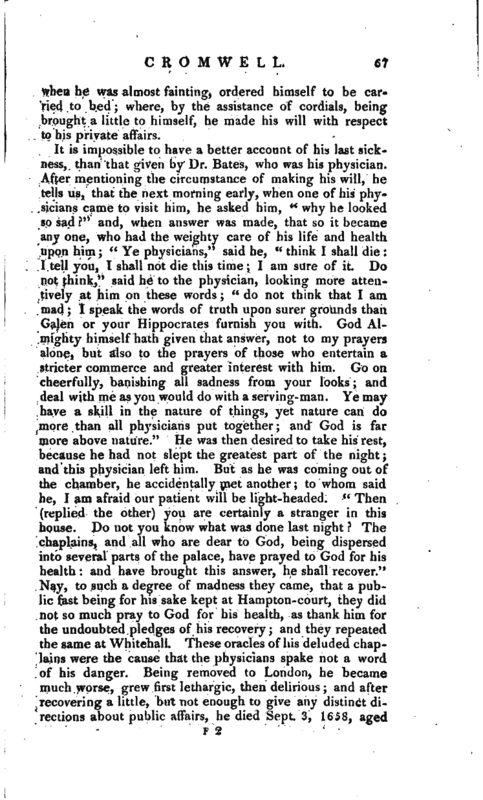 For a week this disorder continued without any dangerous symptoms, insomuch that every other day he walked abroad; but one day after dinner his five physicians coming to wait upon him, one of them having felt his pulse, said that it intermitted. At this being somewhat surprised, he turned pale, fell into a cold sweat, and | when he was almost fainting, ordered himself to be carried to bed; where, by the assistance of cordials, being brought a little to himself, he made his will with respect to his private affairs. The protector’s body, with that of Ireton’s, by a vote of the house of commons, was taken up, Saturday Jan. 26, 1660; and on the Monday night following they were drawn in two several carts to the Red Lion Inn in Holborn, where they remained all night. Bradshaw’s, included in the same sentence, as he had presided at the trial of Charles I. was not taken up till the morning following, the anniversary of Charles’s death, when the three were conveyed upon sledges to Tyburn, and hanged up on the gallows till sun set, then beheaded, and their trunks thrown into a hole under the gallows, and their heads set upon pates upon the top of Westminster-hall, where Oliver’s long remained. Oliver’s scull is shewn in different places, a proof probably that none of them are genuine. Odious as Cromwell’s reign had been, many marks of public approbation were bestowed upon his memory. The poems of Waller, Sprat, and Dryden, though the authors lived to change their sentiments, give a very high idea of him, but allowance must be made for poetical evidence. In his life-time his actions had been celebrated by the learned abroad, as well as by his own secretary Milton at home; and with these panegyrics he seems not to have been displeased. We have indeed various characters of him from persons of various sentiments; yet in most of these there seems to be a mixture of flattery or prejudice. His panegyrists knew not where to stop their praises; and his enemies were as extravagant in their censures. Lord Hollis, in his “Memoirs,” will hardly allow him any great or good qualities; and one principal design of Ludiow’s Memoirs is to represent him as the vilest oi men. Cowley seems to have excelled all others, as well in respect to the | matter as the manner of representing him in the different lights of praise and censure; so that his performance may justly be esteemed the most perfect of any, as it is beyond comparison the most beautiful. It is said, that cardinal Mazarine styled him a fortunate madman: but father Orleans, who relates this, dislikes that character, and would substitute in its place that of a judicious villain. 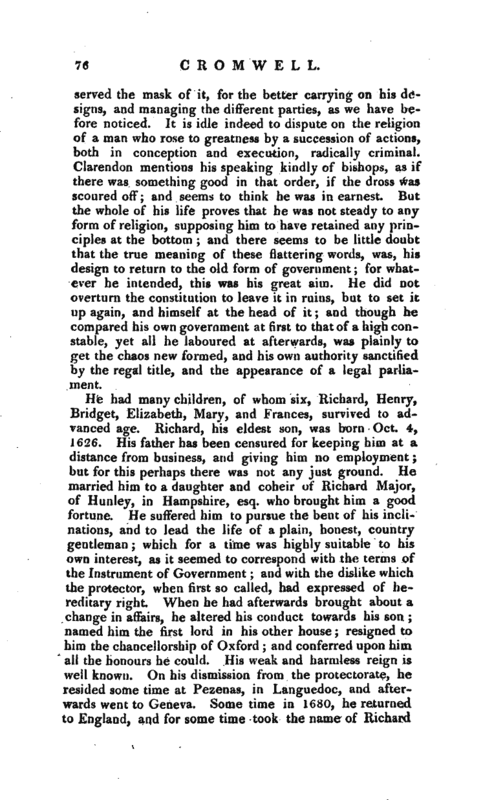 Clarendon calls him a brave, wicked man: and Burnet is of opinion, that “his life and his arts were exhausted together; and that, if he had lived longer, he would scarce have been able to preserve his power.” But this only proves, that the bishop did not discern what resources he had. “how blameworthy soever the protector might have been in the acquisition of his high office, or how wickedly soever he acquired it, certain it is, he rivalled the greatest of the English monarchs in glory, and made himself courted and dreaded by the nations around him. The peace he gave the Dutch was honourable to himself and the nation; and whether he acted prudently or not in breaking with Spain, and allying himself with France, the inequality between the two crowns was far from being as visible then as it has since appeared, and Cromwell always had it in his power to throw himself into the opposite scale if necessary; and he distinguished himself by his interposition in behalf of the persecuted subjects of the French crown. His own government was, however, far from being free from blame. 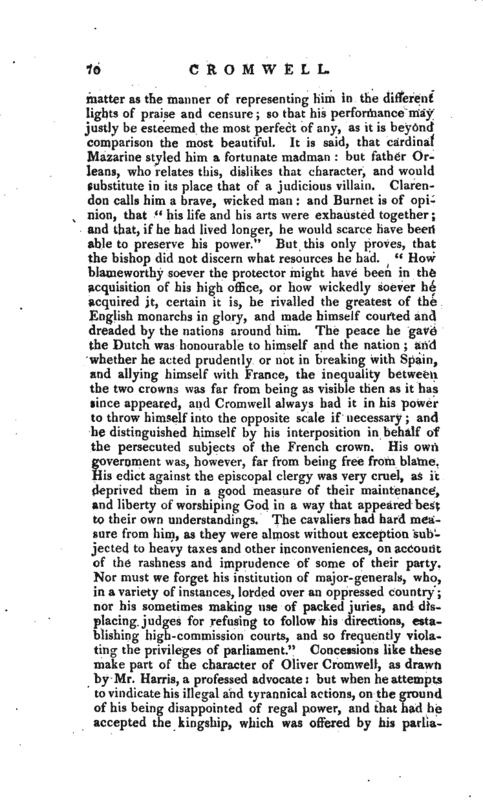 His edict against the episcopal clergy was very cruel, as it deprived them in a good measure of their maintenance, and liberty of worshiping God in a way that appeared best to their own understandings. The cavaliers had hard measure from him, as they were almost without exception subjected to heavy taxes and other inconveniences, on account of the rashness and imprudence of some of their party. Nor must we forget his institution of major-generals, who, in a variety of instances, lorded over an oppressed country; nor his sometimes making use of packed juries, and displacing judges for refusing to follow his directions, establishing high-commission courts, and so frequently violating the privileges of parliament.” Concessions like these make part of the character of Oliver Cromwell, as drawn by Mr. Harris, a professed advocate: but when he attempts to vindicate his illegal and tyrannical actions, on the ground of his being disappointed of regal power, and that had he accepted the kingship, which was offered by his | parliament, a firmer settlement and a milder administration might have taken place, there seems little reason to doubt but the support even of that rank, considering the dangerous and uncertain terms on which he must have held it, would have urged him to the same violent and unwarrantable measures. 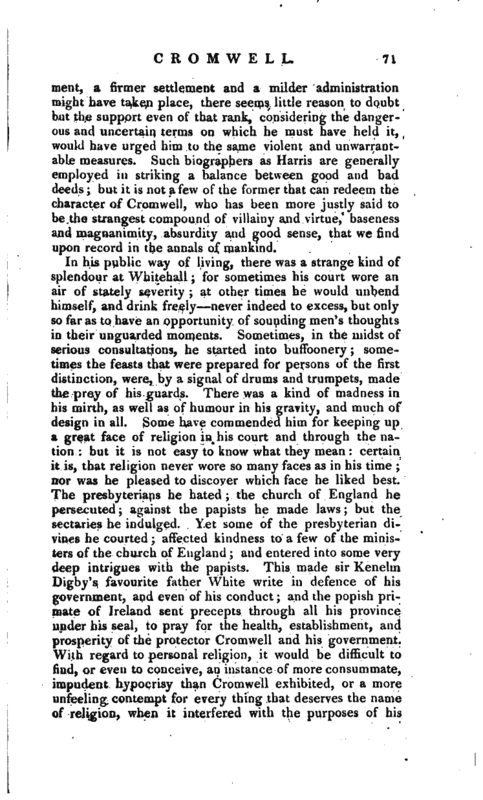 Such biographers as Harris are generally employed in striking a balance between good and bad deeds; but it is not a few of the former that can redeem the character of Cromwell, who has been more justly said to be the strangest compound of villainy and virtue, baseness and magnanimity, absurdity and good sense, that we find upon record in the annals of mankind. In his public way of living, there was a strange kind of splendour at Whitehall; for sometimes his court wore an air of stately severity; at other times he would unbend himself, and drink freely never indeed to excess, but only so far as to have an opportunity of sounding men’s thoughts in their unguarded moments. Sometimes, in the midst of serious consultations, he started into buffoonery; sometimes the feasts that were prepared for persons of the first distinction, were, by a signal of drums and trumpets, made the prey of his guards. There was a kind of madness in his mirth, as well as of humour in his gravity, and much of design in all. Some have commended him for keeping up a great face of religion in his court and through the nation: but it is not easy to know what they mean: certain it is, that religion never wore so many faces as in his time; nor was he pleased to discover which face he liked best. The presbyterians he hated; the church of England he persecuted; against the papists he made laws; but the sectaries he indulged. Yet some of the presbyterian divines he courted affected kindness to a few of the ministers of the church of England and entered into some very deep intrigues with the papists. This made sir Kenelm Digby’s favourite father White write in defence of his government, and even of his conduct; and the popish primate of Ireland sent precepts through all his province under his seal, to pray for the health, establishment, and prosperity of the protector Cromwell and his government. With regard to personal religion, it would be difficult to find, or even to conceive, an instance of more consummate, impudent hypocrisy than Cromwell exhibited, or a more unfeeling contempt for every thing that deserves the name of religion, when it interfered with the purposes of his | ambition. As for the judges in Westminster-hall, he differed with St. John, and was sometimes out of humour with Hale. He set up high courts of justice unknown to the la-v, and put Dr. Hewett to death for not pleading before one of them, though he ottered to plead, if any one that sat there, and was a lawyer, would give it under his hand, that it was a legal jurisdiction; and Whitlocke himself owns, that, though he was named in the commission, he would never sit, because he knew it was not lawful. His majors-general, while they acted, superseded all law; and thv protector himself derided Magna Charta, so much respected by our kings. He was indeed kind to some learned men. Milton and Marvel were his secretaries. 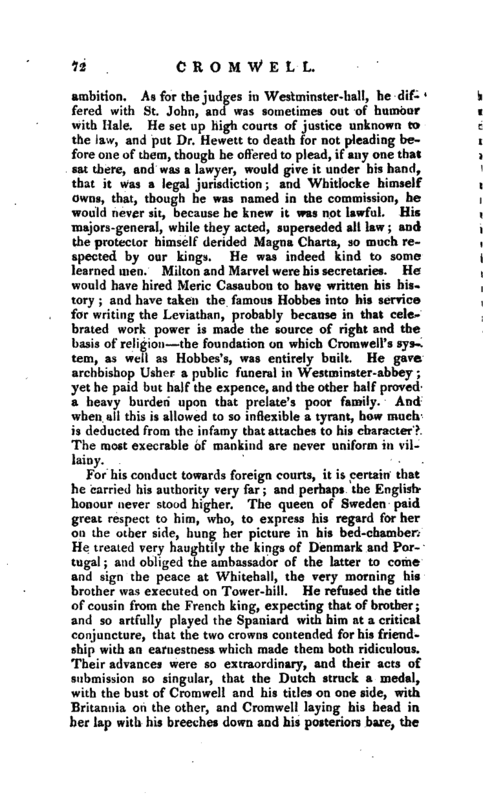 He would have hired Meric Casaubon to have written his his* tory; and have taken the famous Hobbes into his service for writing the Leviathan, probably because in that celebrated work power is made the source of right and the basis of religion the foundation on which Cromwell’s system, as well as Hobbes’s, was entirely built. He gave archbishop Usher a public funeral in Westminster-abbey; yet he paid but half the expence, and the other half proved a heavy burden upon that prelate’s poor family. And when all this is allowed to so inflexible a tyrant, how much is deducted from the infamy that attaches to his character? The most execrable of mankind are never uniform in villainy. 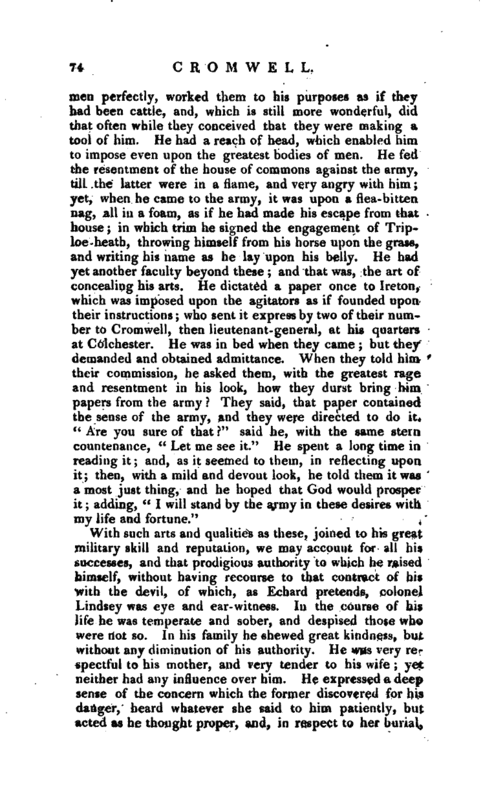 With such arts and qualities as these, joined to his great military skill and reputation, we may account for all his successes, and that prodigious authority to which he raised himself, without having-recourse to that contract of his with the devil, of which, as Echard pretends, colonel Lindsey was eye and ear-witness. In the course of his life he was temperate and sober, and despised those who were not so. In his family he shewed great kindness, but without any diminution of his authority. He was very respectful to his mother, and very tender to his wife; yet neither had any influence over him. He expressed a deep sense of the concern which the former discovered for his danger, heard whatever she said to him patiently, but acted as he thought proper, and, in respect to her burial, | directly against her dying request. His wife is said to have made a proposition tending to restore the king; but he rejected it unmoved, as he had shewn himself before, when his son Richard threw himself at his feet, to dissuade him from taking the king’s life. He did not seem offended at applications of the same kind from other persons, as from Whitlocke, though that gentleman thought he lost his confidence by it; from the marquis of Hertford, whom he treated very respectfully; and from Dr. Brownrig, bishop of Exeter, to whom he shewed more kindness than to any other man of his rank and profession. Asking advice once of this prelate, “My advice,” said he to him, “must be in the words of the Gospel: ' Render to Citsar the things that are Caesar’s, and unto God the things that are God’s:” to which Cromwell made no reply. He shewed a great respect for learning and learned men, without affecting to be learned himself. His letters, however, are the best testimonies of his parts; for they are varied in their style in a wonderful manner, exactly adapted to the purposes for which they were written, and the persons to whom they were addressed. A great number of them are to be found in Thurloe’s and Nichols’s collections, as well as in Rushworth and Whitlocke. His public speeches were long, dark; and perplexed; and though mixed with the cant of the times, yet have sentiments in them which shew a superiority of understanding. Several of these are in Whitlocke’s “Memorials.” In his conversation he was easy and pleasant, and could unbend himself without losing his dignity. He made an excellent choice in those he cmployed, but trusted none of them farther than was necessary. It may seem strange, that in drawing together his character, there should be nothing said of his principles as to government or religion; but the real truth is, that neither run be discovered with certainty. We know that he hated a commonwealth, and the prtsbyterians; but what his sentiments were in other respects, it is not possible to say. When he recollected himself after the follies of his youth, there seems to be no doubt that he had serious impressions of religion; and there seem to be very strong proofs that he was afterwards tinctured with enthusiasm. It is impossible to suppose him a fanatic in the time of his elevavation; it were more reasonable to suppose him gradually to have lost all sense of religion, and only to have | preserved the mask of it, for the better carrying on his designs, and managing the different parties, as we have before noticed. It is idle indeed to dispute on the religion of a man who rose to greatness by a succession of actions, both in conception and execution, radically criminal. 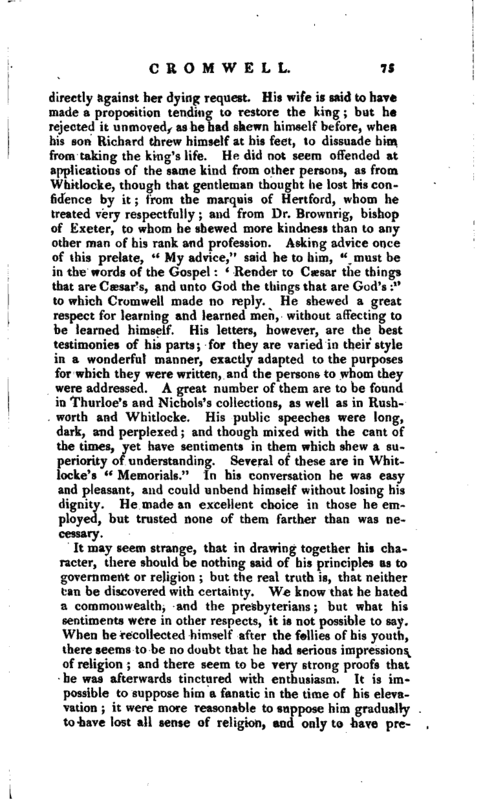 Clarendon mentions his speaking kindly of bishops, as if there was something good in that order, it the dross was scoured off; and seems to think he was in earnest. But the whole of his life proves that he was not steady to any form of religion, supposing him to have retained any principles at the bottom; and there seems to be little doubt that the true meaning of these flattering words, was, his design to return to the old form of government; for whatever he intended, this was his great aim. He did not overturn the constitution to leave it in ruins, but to set it up again, and himself at the head of it; and though he compared his own government at first to that of a high constable, yet all he laboured at afterwards, was plainly to get the chaos new formed, and his own authority sanctified by the regal title, and the appearance of a legal parliament. Biog. 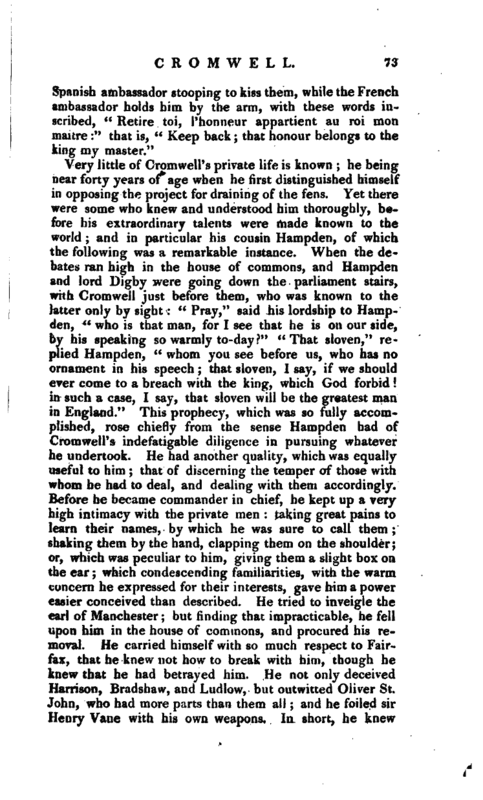 Brit.—History of England.—A minute account of Cromwell’s Biographers may be seen in Mr. Noble’s Memoirs, vol. I. p. 294; and much information of every kind in these volumes.